The final stage of my five-and-a-half month 2014 journey would take me diagonally across Turkey on a journey of more than three thousand kilometres, from the Iraqi border to the edge of the EU. Having only previously explored the predominantly Kurdish Armenian Highlands of the country’s east, I would now embark across several distinct regions of the country. The first part of this stage would take me from the hazy plains of Upper Mesopotamia, with their remnant population of Assyrians and Arabs through the tense, unofficial Kurdish capital of Diyarbakır then turn north into the rolling mountain landscape of Anatolia. Here I would see what strikes me as the Turkish heartland and glimpse layers of history from the most ancient Anatolians; the Hittites who centred their empire in Hattusa; the Eastern Roman buffer state of Commagene and the glorious architecture of the Seljuks, ancestors of modern-day Turks, before stopping in the Turkish capital, Ankara. It’s well after dark on the 23rd October 2014 as I cross the Habur River into Turkey, quickly passing through customs and arriving in the city of Cizre, located on the Tigris alongside the Syrian border, a little more than an hour later. Cizre is an ancient city, historically the gateway between the mountains of Armenia and the plains of Upper Mesopotamia. It is regarded in the Islamic tradition as the city founded by Noah at the foot of Mount Juda, where the Ark came to rest. Until the twentieth century Cizre would have been a polyglot city, located in the Assyrian Heartland with populations of Assyrians and Armenians. However, the Armenian and Assyrian Genocides of 1915 decimated these populations and has left the population predominantly Kurdish. The Kurds also have their grievances with the repressive Turkish State and there is a palpable air of tension in Cizre. Earlier in the month, riots broke out which saw at least thirty-five Kurds killed by Turkish security forces and as I stop in the city’s main street, I notice an abundance of Cobra infantry carriers belonging to the Jendarma, the Turkish paramilitary security and law enforcement force. I’m hosted in Cizre by Şeyhmus, a local English teacher. We meet in the city centre and have some tea in a university chaikhana (tea house) before retiring to the family home, which sits away from the street in a gated courtyard, away from the eyes of the Jendarma. 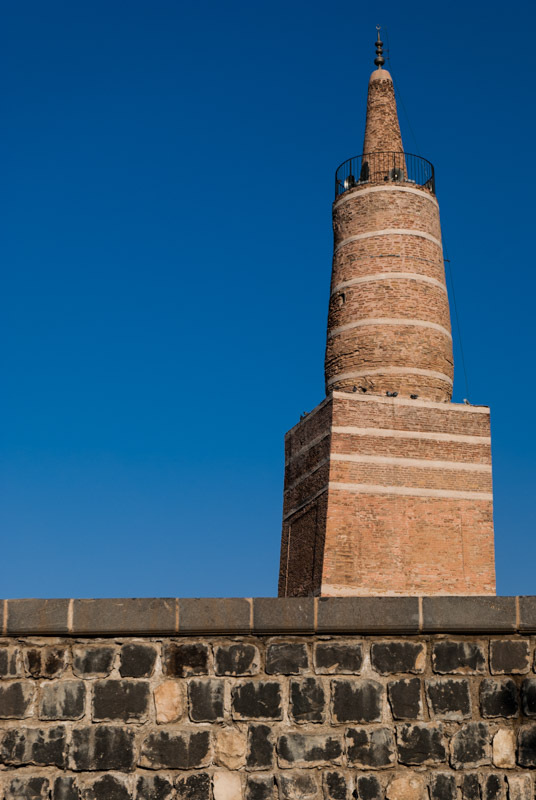 Early next morning, Şeyhmus and I visit Cizre’s twelfth century Grand Mosque, a rather squat building made of ancient stones but topped by a distinctive, tapering and slightly crooked brick minaret, reminiscent of a Mesopotamian ziggurat. We then proceed to Şeyhmus’ school where, after meeting numerous classes of excitable Kurdish children, and breakfast with his fellow teachers, I say goodbye and begin my journey westwards. The road climbs briefly out of Cizre, tracking the edge of the Mesopotamian Plain onto an upland area known in the local Syriac language as Tur Abdin; a rocky, scrubby landscape dotted by Assyrian villages of attractive yellow limestone houses. Although the Assyrian population was decimated by the genocide of 1915, it was in Tur Abdin that the Assyrians put up a successful resistance to the bands of Kurdish irregulars armed by the Ottomans and sent to murder and expel Christians from Ottoman territory. This is therefore the only region of Turkey where Assyrians continue to live in their ancestral homeland, though they remain the subject of government harassment. I stop at the Mor Gabriel Monastery, established in the late fourth century BCE making it the oldest Syriac Orthodox Monastery in the world. Still active, Mor Gabriel has weathered the Mongols, Tamerlane and Ottomans and remains a delightfully tranquil sanctuary in this troubled region. It’s a perfect autumn day and a real pleasure to drive through the quiet villages of Tur Abdin. 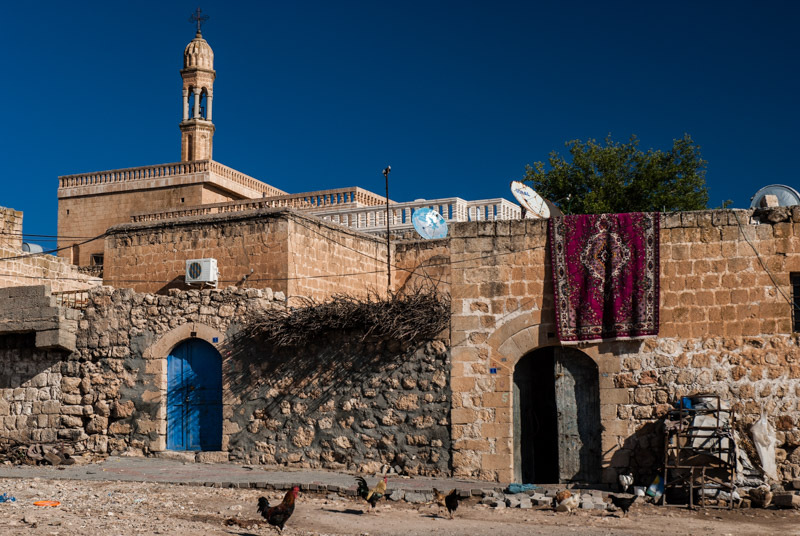 I stop first in Anıtlı (known as Hah in Syriac), a village of fortified stone houses with the gorgeously carved, fifth century Mother of God Church. 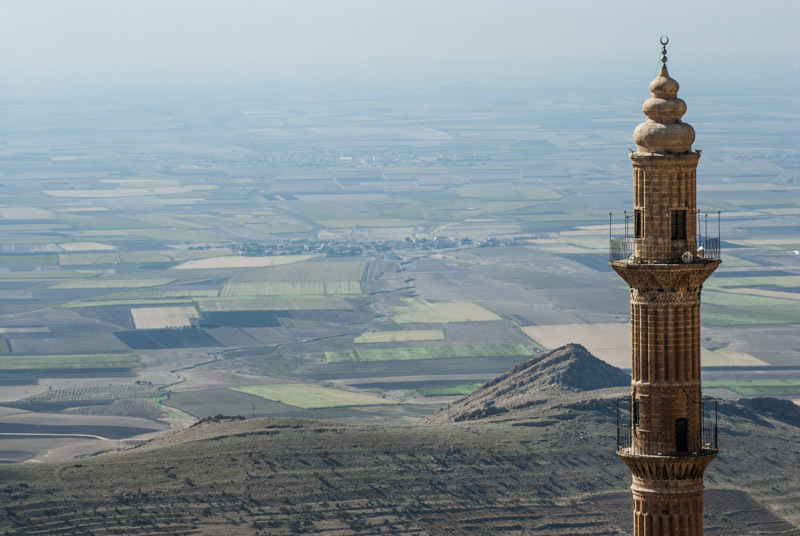 Nearby İzbırak (Zaz in Syriac) presents an imposing view over the plains of ancient-looking yellow stone buildings etched against the piercing, cloudless blue sky. Sadly though, on closer inspection, one can see that much of the village is abandoned, its population having withered during the course of the twentieth century. The city of Midyat marks roughly the western extent of the Assyrian villages of Tur Abdin and I spend the afternoon exploring the winding back-streets of the Old City, elegantly built from local yellow limestone and dotted with old churches and fine houses, though some show signs of neglect, most likely due to their owners having emigrated. It is nevertheless a clear change from the Kurdish east of the country where settlements are almost invariably shabby, charmless and sometimes rather squalid. My destination for the day is the city of Mardin which I reach in the evening. Famed for its beautiful yellow limestone houses which spread picturesquely up a steep hillside, Mardin attracts domestic and international tourists and has something of a modern, dynamic air. I’m hosted here by Erbil, a Turk from the west who works as an engineer for the Turkish Army and lives in a small, cavernous house in the heart of the Old City. Mardin in some respects looks a little like Midyat and has a number of churches, but it is the Islamic architecture of the city which is most striking. As the final capital of the Artukid Dynasty, one of a number of Turkic dynasties who arrived from Central Asia and began the Turkification of Byzantine Anatolia, Mardin was richly endowed with fine medieval architecture. I spend an entire day walking through the narrow and atmospheric alleyways and back-streets, encountering several of these magnificent edifices such as the fourteenth century Şehidiye Madrasa (seminary), whose minaret soars above the city’s rooftops, overlooking the hazy fields of the Mesopotamian Plains. Others include the imposing Zinçiriye Madrasa, another fourteenth century Islamic seminary with a magnificently carved portal and fluted, segmented dome. The twelfth century Grand Mosque, one of the oldest in Anatolia, is marked by its square-based minaret of finely carved local yellow stone, which overlooks the narrow lanes of the bazaar, beautifully scented by the fragrances of Mardin’s famous hand-made soaps. Mardin quickly becomes perhaps my favourite small city in Turkey. 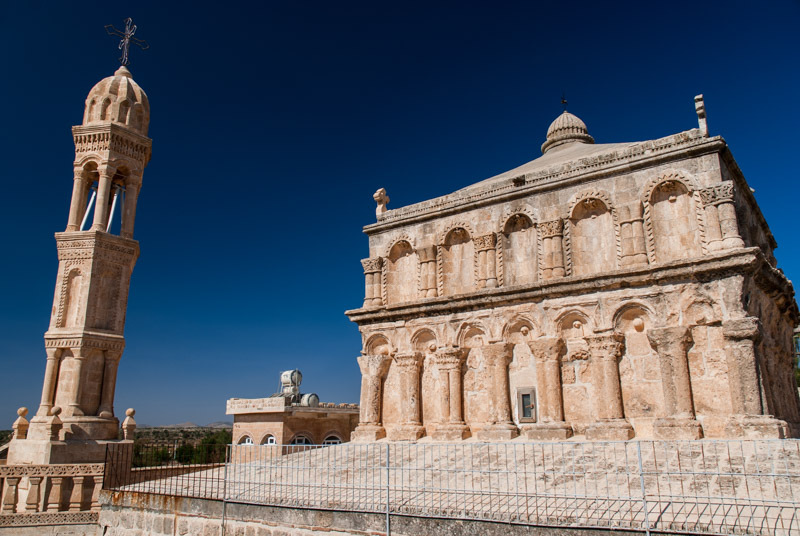 I leave Mardin the following morning, heading south onto the plains of Mesopotamia, passing the fifth-century Mor Hananyo Monastery, seat of the Syriac Orthodox Church from the twelfth century until 1933. The view back to Mardin’s steep streets soon recedes as I head towards the Syrian border, stopping at the ruins of Dara. Dara was a fortress of the Byzantine Empire situated on its eastern border with Sassanid Persia and site of the Battle of Dara in 530. Today the site is in ruins, but an intriguing cave-necropolis remains, as do several water cisterns, though the tranquillity of the site is rather ruined by persistent begging of a pack of Kurdish urchins from the nearby village. Joining the highway from Dara, I am driving exactly along the Syrian border; in places the barbed wire fence is just metres from the road. Beyond is a country of which I have very fond memories of visiting in 2006, though which is presently embroiled in a brutal civil war. In Nusaybin I head north, climbing back onto the Tur Abdin Plateau, passing through Midyat once more and descending to the Tigris River in the poignantly beautiful town of Hasankeyf. The legendary Tigris, which flows down to the fertile plains of Iraq and nurtured the origins of human civilisation, has carved steep cliffs in which caves were carved by Hasankeyf’s earliest inhabitants. 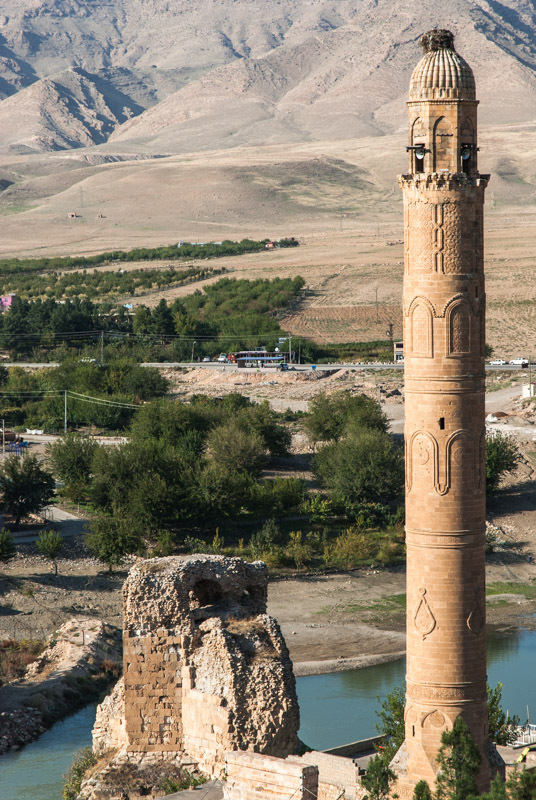 Today the archaeological site is off-limits for ‘safety’ reasons, but amongst the scruffy buildings of the modern town are more endowments from the Artukids, who made Hasankeyf their first capital, such as the El Rizk Mosque with its ornately carved minaret, now topped by a stork’s nest. The valley below is very picturesque, with the turquoise Tigris watering stands of green trees in a powdery-grey, dry landscape; a scene which reminds me of the valleys of northern Pakistan or Afghanistan but one which sadly will soon disappear, to be flooded by the Ilısu Dam sometime in the next few years. From Hasankeyf I roughly follow the Tigris west through Batman, passing working pumpjacks and fields of ripe cotton to Diyarbakır. 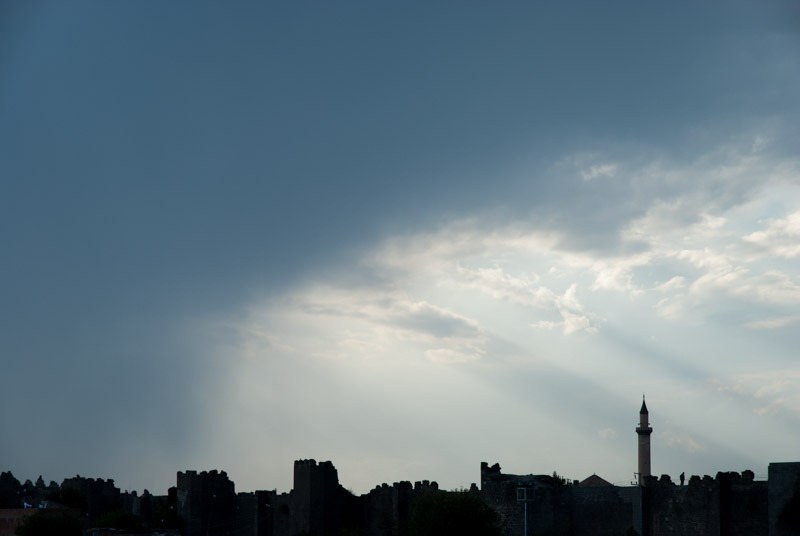 Considered the unofficial Kurdish capital of Turkey, I first passed through Diyarbakır in 2003 on my first overland journey across Asia and remember being driven around a hot, shambolic city by an Air Force pilot whom I had met at the bus station. Today, I arrive in the western suburbs of a vibrant, buzzing city very different from that which I remember. I meet my host Ferhat, a Kurdish logistics manager recently returned from working in Istanbul and Antalya in the west of the country, who proceeds to show me his home city. We eat the best lahmacun (a ubiquitous Turkish type of pizza) I would ever taste in Turkey, then move on to have coffee in a café filled with a young, intellectual-looking crowd. After this, we move into the Old City, which is heavily policed by the Jendarma in infantry carriers, water cannons and assault vehicles. There’s a palpable sense of tension in the air and as we walk through the bazaar; trade has wound down for the day, but we watch a mob starting to form around a thief, filling the streets with shouts and crowds of onlookers. Ferhat takes me to the beautifully restored, black basalt Deliller Khan (caravanserai), an ancient traders’ inn now converted into an allegedly Armenian-owned hotel and restaurant, where we sip a good red wine made by local Assyrians; a pleasing sign of latent cosmopolitanism in this ethnically cleansed land. Inside is a well heeled crowd, many couples and groups of women who Ferhat tells me are most likely students from the west of Turkey. On our way back to the truck, we pass through the Old City walls and my eyes start to sting slightly. Ferhat soon sniffs and tells me there is tear-gas in the air: something is going on, and two youths coming from the opposite direction confirm there is some trouble, and that police have barricaded the streets. By the time we reach Ferhat’s Mother’s smart new apartment on the western edge of the city, I’m deeply impressed by the contrasts I have seen in just one evening in Diyarbakır. I spend the whole of the following day with Ferhat exploring Diyarbakır, which feels slightly calmer in daylight. 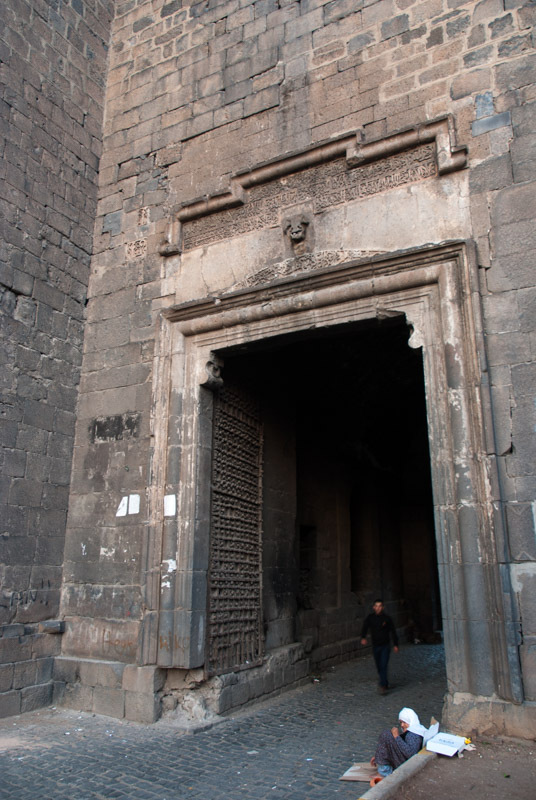 I’m drawn to the Old City, which is surrounded by imposing black basalt walls several kilometres in length and largely intact, making Diyarbakır a rare example of a preserved, walled medieval city. In a central street, lined by khans and ancient shopping arcades, is a central square where men sit at small tables drinking tea and playing backgammon. Much of the central city architecture consists of black-white banded architecture reminiscent of Umayyad architecture of the Middle East. The eleventh century Grand Mosque, which sits behind the square, is an eleventh century Seljuk structure executed in black basalt, but incorporates two tiers of arcaded Corinthian columns taken from an earlier Roman theatre during a twelfth century reconstruction, which reminds me somewhat of the Grand Mosque of Damascus. In the east of the Old City is a small Christian Quarter, and we visit the Assyrian Mor Petyun Church and Armenian St Giragos Church; both made from local black basalt and both having an ever decreasing congregation. In the afternoon we scale the city walls for views across the city and surrounding countryside, but as we walk towards the western edge of the walls we enter a slum area; there are signs of drug use around and when walking in the narrow streets below the walls, I get a sense of not being absolutely safe; something which happens so rarely in Asia I can only remember one similar instance, in Osh, Kyrgyzstan. Diyarbakır is indeed in some ways the centre of the Kurdish insurgency and was off-limits for security reasons during the 1980s. Operations and land expropriations by the Turkish government continue to target these areas in order to counter ‘terrorism’. In the evening, Ferhat and I sit out on his mother’s balcony, watching the light fade over the city. Like all Turkish Kurds, Ferhat is distressed by the treatment of his fellows in Turkey, though like most whom I have met, he does not desire a separate Kurdish state, simply recognition and equality in his home country where, until 1991, Kurds were described officially (and erroneously) as ‘Mountain Turks’ and where it remains illegal to teach Kurdish in any school. Unlike Assyrians and Armenians however, the position of the Kurds must inevitable improve, if for no other reason than force of numbers. Kurds currently make up around a fifth of the Turkish population and have a far higher fertility rate than Turks; as is perhaps well demonstrated by the sea of new apartment buildings in this affluent suburb of Diyarbakır. Leaving the Tigris Valley, I continue my westward journey to the junction town of Siverek and south, back to the fringes of Mesopotamia, towards the city of Şanlıurfa. I stop short however to visit one of the world’s most intriguing archaeological sites: Göbekli Tepe. Located on a prominent hill, Göbekli Tepe dates back to the Pre-Pottery Neolithic period, from which time there are numerous sites across the Levant and Upper Mesopotamia. 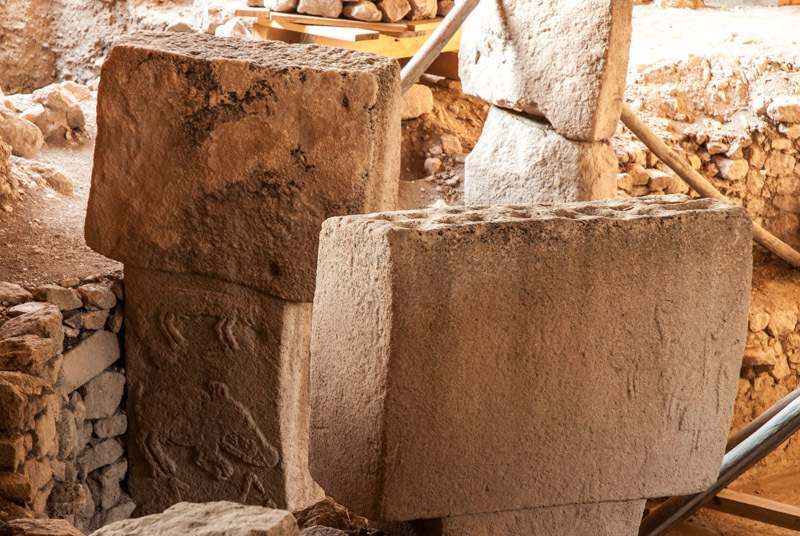 What makes Göbekli Tepe special however is the unearthing of what appears some kind of temple, used for social and ritual activities, dating to the tenth or ninth century BCE, greatly predating the cities of Lower Mesopotamia. Göbekli Tepe therefore challenges the dogma that the construction of monumental complexes would only be possible by civilised, settled societies and not the presumably hunter-gatherers who must have constructed the site. The main excavations consist of five circular pits, seemingly randomly arranged, each with T-shaped megaliths set radially around the pit edge. Many of the megaliths bear reliefs of animals, more finely carved than the rock art which typifies the period and the largest, which stand around five metres tall, show what looks to be a highly stylised human figure. The arrangement of stone circles reminds me of other megalithic temples but the carvings are unprecedented and fascinating. The meaning of the carvings, the precise function of the site and the means by which an apparently unsettled society made such a complex are a mystery. There are numerous un-excavated sites nearby which appear to have similar T-shaped megaliths, which makes one wonder how many more, potentially older, Göbekli Tepes there might be. I find Göbekli Tepe a deeply thought-provoking, even moving experience. To look back more than ten thousand years to what is perhaps one of humanity’s earliest complex constructions makes one think how young human civilisation really is, and that despite the gruesome recent history and troubled present seemingly driven by barbaric nationalism, humanity has progressed hugely in what is, relatively, a very short period of time. 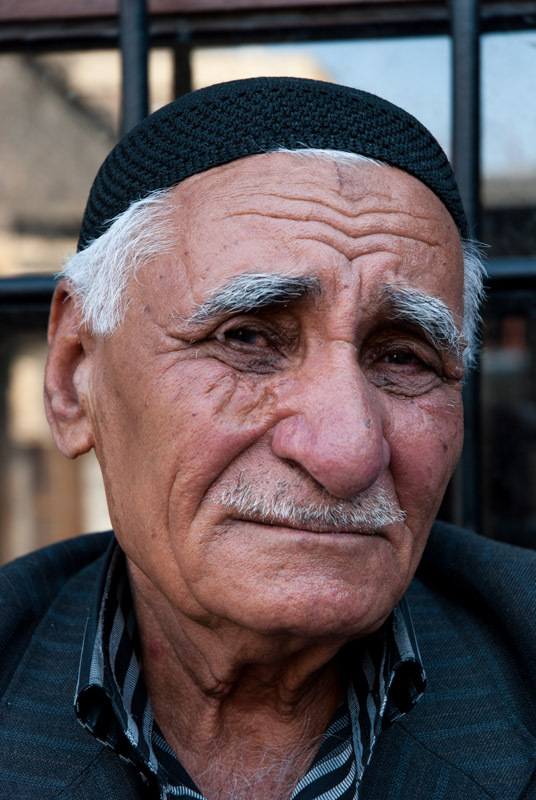 I make my way into Şanlıurfa, known simply as Urfa, later in the afternoon and join my hosts, brothers Emin and Mustafa, two Arab Turks who hail from very close to the Syrian border. Urfa is an ancient city, officially founded by the Seleucids, who named it Edessa, but perhaps far older. Emin and Mustafa take me on a tour of Urfa in the evening, around the busy streets and to the holy shrine known as Abraham’s Pool. Urfa is one (somewhat unlikely) candidate for the Biblical city of Ur of the Chaldees, birthplace of Abraham, and local tradition has it that King Nimrod immolated Abraham here on a funeral pyre, only for it to be turned by God into water, with the coals becoming fish in what is now known as Abraham’s Pool. On the way back home we pick up a künefe, an originally Arabian, rich cheese pastry soaked in syrup and served hot, which makes a nice end to a great day. 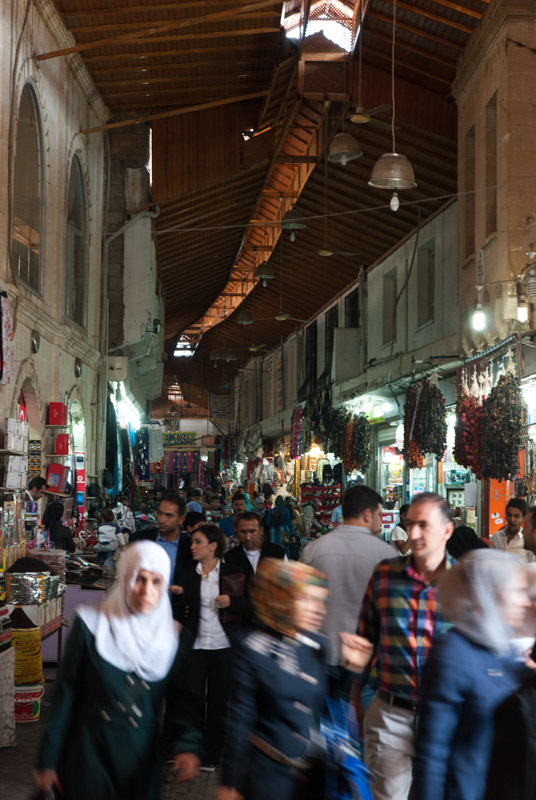 I spend the whole of the following day walking around Urfa. The city has a strong Middle Eastern flavour, with many Turkish Arabs and Arab visitors, but it is undoubtedly Turkish. I particularly enjoy the rich bazaars which remind me further of the Levant, narrow, labyrinthine streets and attractive urban architecture of arcaded shops and two-storey caravanserais built from white stone. Urfa is my last stop in Mesopotamia and I leave the city on a rainy morning, heading north and closing a loop back to Siverek, then quickly west to catch a ferry across the Euphrates, passing by a new bridge which is just a few metres short of completion. On the right bank of the Euphrates I am immediately in the Taurus Mountains, under the slopes of Mount Nemrut, on the summit of which one finds one of Turkey’s most iconic sites. This region was once part of the Kingdom of Commagene, a small state which emerged from the disintegrating Seleucid Empire and lay on the border of Hellenistic and Persian civilisations, itself a mixture of Greek, Armenian and Persian influences. The most famous king of Commagene, Antiochus I Theos, built a mountain-top sanctuary here in 62 BCE consisting of a pantheon of huge, seated gods (including himself) from the syncretic religion of Commagene. 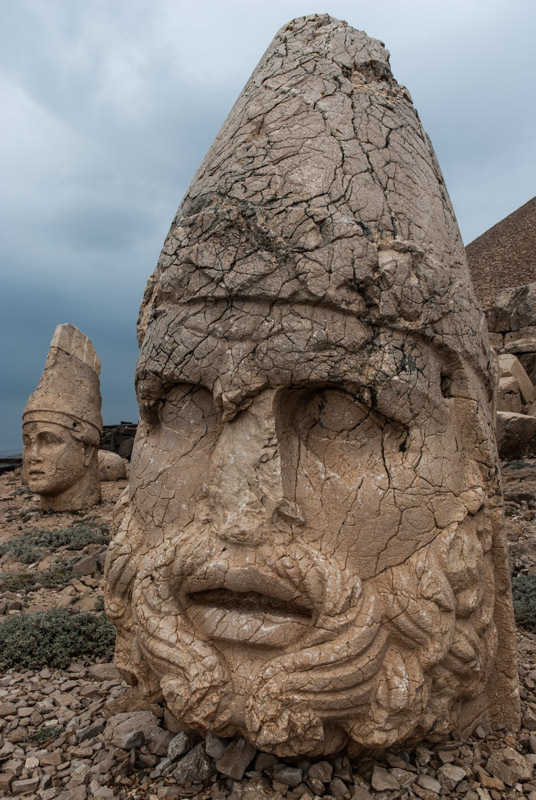 Back in 2003 I had wanted to visit Mount Nemrut, but being without my own transport and failing to find any other travellers in the fly-blown town of Kâhta with which to split the cost of a tour to the summit, I left disappointed. Today the weather is bad, but I fulfil this frustrated ambition from eleven years ago, driving myself up a paved road to a large car park at around two thousand metres elevation. It’s out of season and I have the site almost to myself, which certainly makes up for the overcast weather. After a short walk, one reaches the ruins of King Antiochus’ sanctuary, surrounding a scree-covered summit which is thought to cover his tomb. The statues must have been a stunning sight when complete, but at some point in history unknown iconoclastic zealots have systematically beheaded them, leaving the heads surreally detached on the stony mountain slopes. 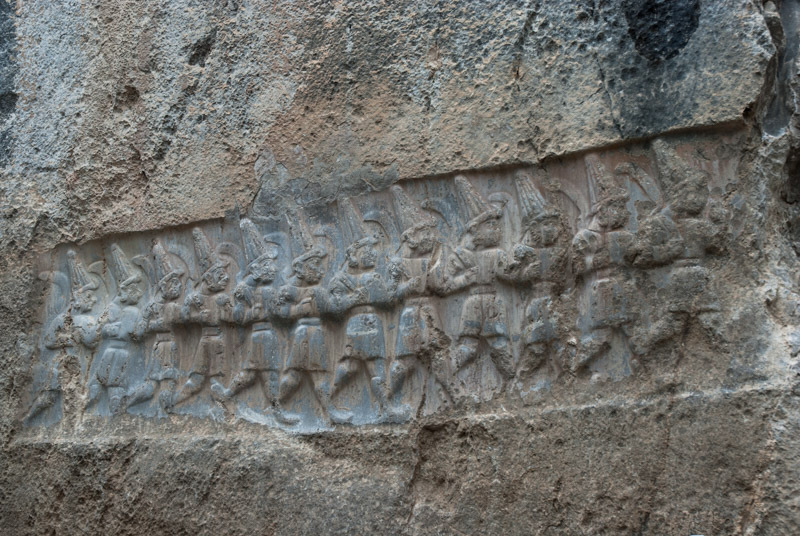 Nevertheless, the carved features of the heads remain well preserved and show figures representing Greek, Armenian and Persian mythology; Heracles (Hercules), Apollo, Zeus-Oromasdes (a Greek-Armenian hybrid); Persian-style eagles and lions, Tyche, the goddess of Commagene and of course Antiochus I Theos himself. I descend the mountain on small roads to the west, stopping at Arsameia, site of a funerary monument to King Mithridates I Callinicus, son of Antiochus I Theos, which contains a stunning relief of Antiochus shaking hands with the god Hercules. I stop again at the Karakuş Tumulus, burial site of female members of the Commagene royal family, from where I get a final glimpse of the Euphrates as darkness falls. I then drive south through Kâhta, which seems far less squalid than I remember it; west, through Adıyaman and round, climbing northwards into the Taurus Mountains on a traffic-choked road, crossing a low pass and driving into the night through persistent rain. 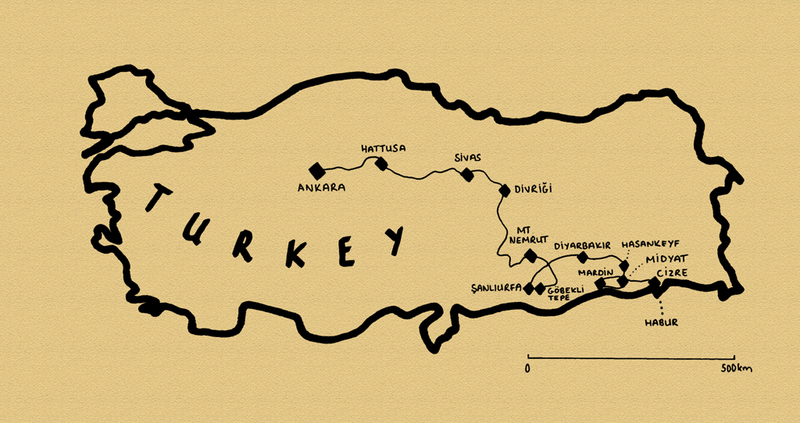 I stop finally and sleep in an apricot orchard near the city of Malatya, where I had spent a night in 2003. Continuing north, I spend the morning driving in a ruggedly beautiful, autumnal landscape of mountain valleys on good, quiet roads and at around lunchtime stop in the charming town of Divriği. Since leaving the surroundings of Malatya this morning, I have realised that I am seeing yet another side of Turkey; not the Kurdish east or the plains of Mesopotamia, but Anatolia proper, the Turkish heartland. 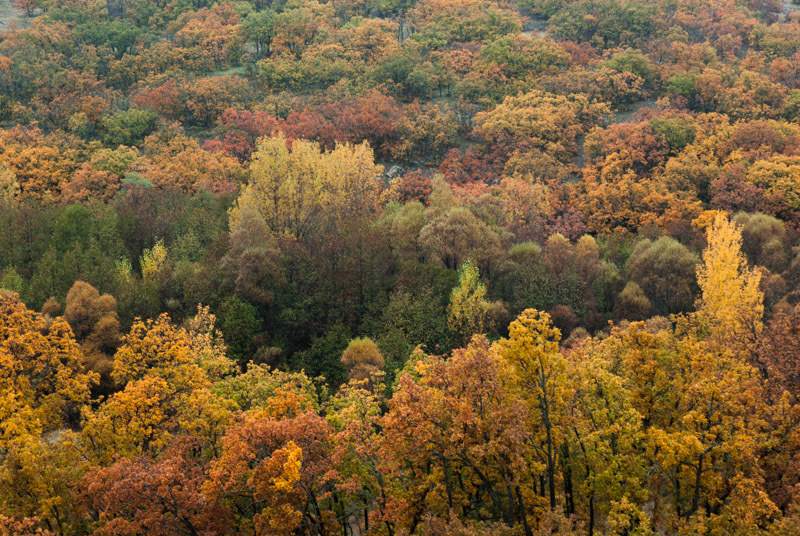 All around are poplar and apricot trees in vivid autumnal yellow and orange. Instead of the squalid villages of the east with their mostly style-less concrete hovels, here are villages of individually-built houses with attractive terracotta tiled roofs. Divriği seems to embody all these changes in character, and I find myself instantly liking the place. Although founded by heretic Armenians in the ninth century, Divriği is famous for its UNESCO World Heritage-listed Grand Mosque and Darüşşifa (hospital), a thirteenth century complex constructed by the local Mengüjek House of the Seljuk Dynasty, and is among the most beautiful buildings in Anatolia. The portals of both mosque and hospital are densely covered in highly elaborate carvings, an unrestrained riot of artistry which combines geometric designs with huge flowers and even a two-headed bird; certainly the most expressive Islamic sculpture I have seen, though I suspect the mason would have been of Armenian origin. In contrast to the extravagant portals, the rest of the building has the solid, militaristic bulk typical of Seljuk architecture, but somehow the two styles offset each other to great overall effect. As I arrive at the complex, a loud and poetic azan (call to prayer) fills the valley in which the town sits and men, mostly wearing dark blazers, begin to congregate to hear the Friday noon sermon, despite the unrelenting rain. As the men begin to pray, I enter the Darüşşifa which is just as impressive inside as out, with a beautifully vaulted ceiling, carved pillars, a central fountain and cantilevered staircase leading to an upper level separated from the main hall. Despite being relatively newly arrived from the nomadic steppes of Central Asia, it is clear from buildings such as this that the Seljuks were no barbarians and quickly established the infrastructure of civil society. Once the sermon has ended, I move next door into the mosque which has a large open prayer area between huge pillars supporting a finely moulded dome. As the last of the locals file out, I am left in the cool, calming mosque with only the mullah in the corner, kneeling and reading a Quran, deeply in thought. Down in the town centre I am further delighted by a compact bazaar with cobblestone streets strung with vines. Despite the pouring rain there is plenty of activity in town, with men standing in doorways and under roof eaves chatting and smoking. Women are also far more prominent than in the towns of the east, usually uncovered, out having tea together in restaurants, driving cars and shopping. Divriği feels to me like my first real Turkish town, here in the mountains of Anatolia. 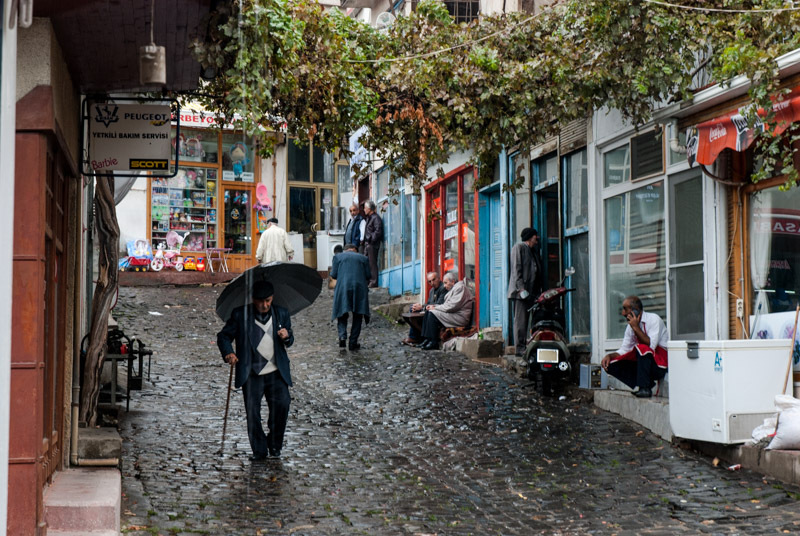 By mid-afternoon, with the rain still coming down, I leave Divriği and drive north on more beautiful, winding roads to meet one of the country’s main west-east roads and turn west to the regional capital of Sivas. Known to the Romans as Sebasteia, Sivas was a regional capital of the Byzantine Empire, was the first major city to be taken by Turkic tribes arriving from the east and was later incorporated into the Seljuk Sultanate of Rum in 1174, periodically serving as its capital. Later, under the Ottomans, Sivas would lose its historically important position but remains today as a pleasant and unpretentious provincial city well endowed with some of the finest examples of Seljuk architecture. 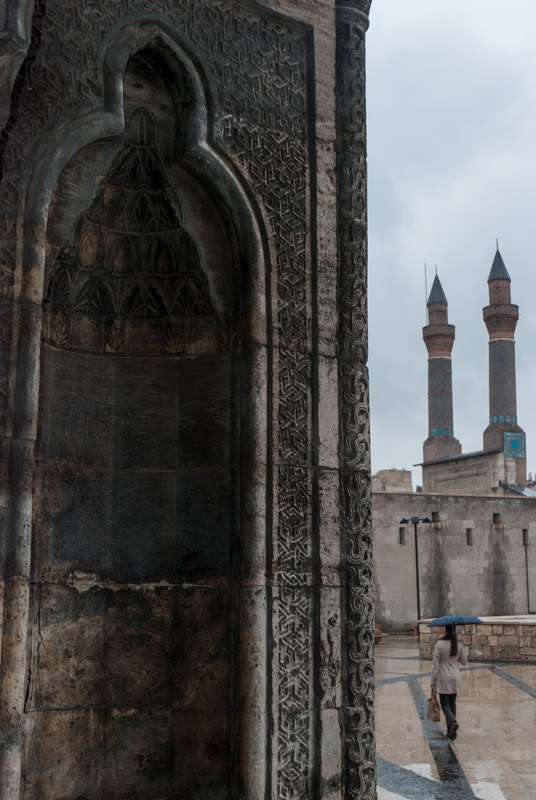 I spend a morning walking around the centre of Sivas in the cold, incessant rain admiring the beautiful medieval madrasas. Particularly pleasing is the city’s central Seljuk Park containing the Çifte Minareli Madrasa with its twin, needle-like minarets; facing this, the extremely fine carvings on the facade of the Şifaiye Madrasa which now operates as a restaurant, and beyond this, the stubby but imposing Buruciye Madrasa with a beautifully carved portal, now a chaikhana. 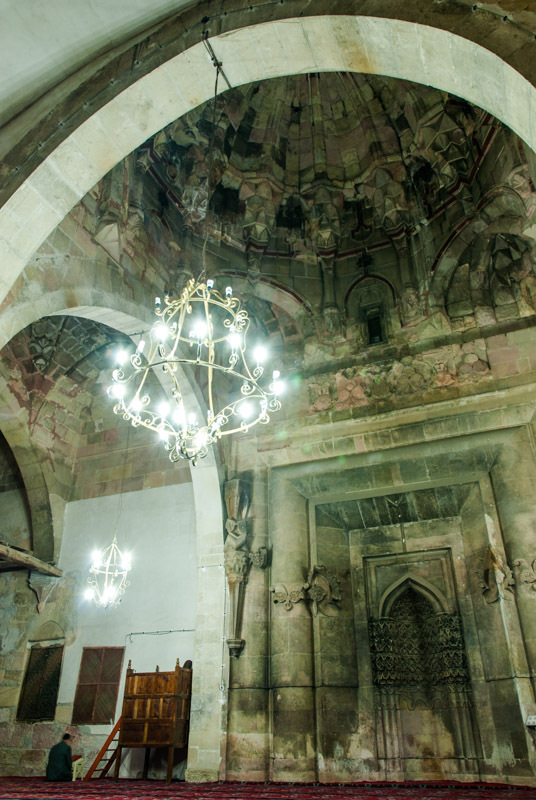 Whilst none of these is quite as fine as Divriği’s Grand Mosque and Hospital, their location in the centre of a modern-day city gives them a wonderful sense of continuity of the original Seljuk civic designs. I leave Sivas in the afternoon, heading west. With now more than thirty six hours of continuous rain and temperatures in single figures at night, the balmy warmth of Mesopotamia seems a long way off. I drive into the night, leaving the main highway in Yozgat and stopping for the night in a field just outside of the village of Boğazkale. Long before the Seljuks or Byzantines, in the second millennium BCE, the Hittites rose from somewhat obscure origins to build the first Anatolian empire; contemporaries (and rivals) of the empires of Assyria and Egypt. The Hittites, speakers of the earliest identifiable Indo-European language, controlled an empire which at its zenith in the mid fourteenth century BCE controlled much of Anatolia, Upper Mesopotamia and the Levant, but rather mysteriously disappeared in approximately 1200 BCE. Boğazkale lies alongside the ruins of Hattusa, the capital of the Hittites, surrounded by a rolling Anatolian landscape of fields, hills and oak forests. I start the day in the Hittite sanctuary known in Turkish as Yazılıkaya, where in a small rocky canyon at knee-height, two thirteenth century BCE friezes depict processions of deities in distinctive Hittite dress; males deities on one side in short skirts, pointed shoes and tall, horned hats and females on the other in long skirts, wearing crowns. Beyond the friezes are further, better preserved carvings showing twelve gods of the Underworld; an odd, armless representation of the god Nergal from the Babylonian pantheon who is mentioned in the Old Testament, and a carving of the god Sharruma (borrowed from the Hurrian pantheon) and Hittite King Tudhaliya IV who may have been be buried here. 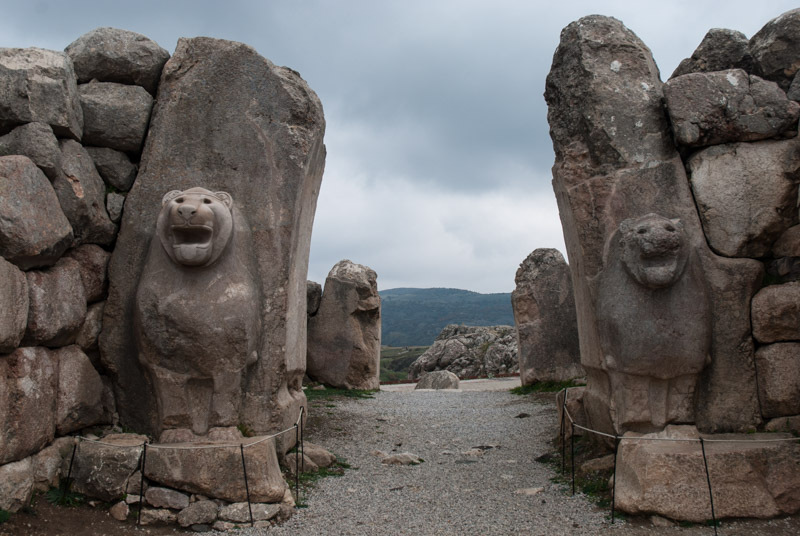 Down on the valley floor lie the remains of the city of Hattusa itself, with Cyclopean walls enclosing an area of almost two square kilometres, which would have contained numerous temples and a central citadel with the royal residence. There is however little to see beyond foundations, although the city walls, dating from the fourteenth century BCE still retain a number of gates named after the carved figures which guard them. Most impressive however is the thought that with a population of perhaps forty or fifty thousand, Hattusa would once have been one of the world’s largest cities. Leaving for Ankara, I take a detour through the small town of Alacahöyük, which sits next to an excavated höyük (settlement mound) and has been continually inhabited since the Bronze Age. Besides an impressive Hittite gate very similar to those of Hattusa, the site is notable for a collection of graves of the Hatti, the oldest recorded Anatolian civilisation, cultural forebears of the Hittites who lent their name to Hattusa and left fantastic bronze and gold artefacts with the dead which they buried. As I drive the final stretch of highway towards Ankara in the evening, I realise that Anatolia is something of a new region of Eurasia to me; one that is very different from the eastern region of Turkey with which I am more familiar, and with its soft, rolling landscape, rich history and attractive villages, is an area I look forward to further exploring.